> Click on most pictures to enlarge. > For a few of the links you need to use the back button to return to the Home page. These beautiful Gold Star Spitfires (GSS) had the same frame as the BSA Rocket Gold Stars (GA10) with the exception of the passenger peg (pillon) frame loops and were advertised as Gold Star Spitfire Scrambler. According to Ian Jackson of the Gold Star Owners Club UK (GSOC), the dispatch records only show 266 GSS's being shipped during the 1963 model year. However as stated above there were 272 made; so that created a mystery! 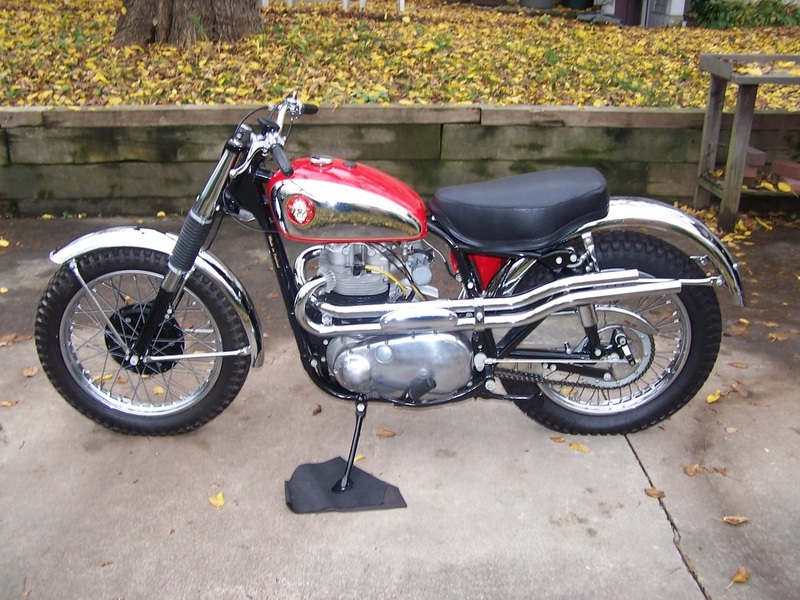 I stumbled upon an owner in Washington who said he had a 1962 GSS according to his title, and the bike did not have the pillon loops (see 1962 Custom below). I asked him to send me the engine and frame numbers so I could check with Ian at the GSOC to confirm when it was shipped and how it was recorded. It turns out it was shipped on 21 June 1962 to Hap Alzina and it was listed in the dispatch records as an “A10 Rocket Gold Star.” According to Ian there are no references in the dispatch records to “Scramblers” prior to October 17th 1962. I have since referred 8 more discoveries to Ian and they were also listed as RGS's in the dispatch records prior to October 1962. Unfortunately, they cannot be recognized as possible GSS’s due to the dispatch records. To date, 35 bikes are confirmed as recorded in the dispatch records as GSS’s from October 17th 1962 to July 10th 1963. Therefore, due to possible inaccuracies in the dispatch records, the true total number produced may never be known. "Bike was bought from Dewey's Cycle Shop Seattle Washington, 10/27/62 by Gordon Devenny, who hill climbed it at the Seattle International Raceways on the hill known as the Widowmaker. It was then sold to Art Foss, of the Foss tugboat family. Art owed me money in 1972 and could not pay it. He had already customized the bike; he had $ 3000.00 in chrome work and labor from a Brit bike mechanic in 1972 dollars. He signed the title over to me and physically gave me the bike to hold as collateral. Art never could come up with the money he owed me, so the bike sat for roughly 12 years, never even moved. It became quite obvious I was the new owner, so I decided to get it running. I ran it from 1984 until it blew a head gasket in 1999; it then sat for 7 more years (too lazy to fix it). Then I got serious in 2006 and did the head gasket, re-did the magneto and dyno, and added a new exhaust, new Fire Engine Red Paint, removed the 18" over front forks, (that was like trying to ride a pogo stick straight forward and all it wanted to do was go sideways), and bought Forks By Frank at 6" over. I then passed the bike skill test with 100% score for my Washington State endorsement. The bike right now, since new, would be lucky to have 10,000 miles on the motor, it is tight and solid." Bill N.
This GSS sold in a Las Vegas auction, January 2011 for $19,750. Following is how the bike was described in the auction lot description: "A fully restored and correct Rocket Gold Star Spitfire Scrambler. 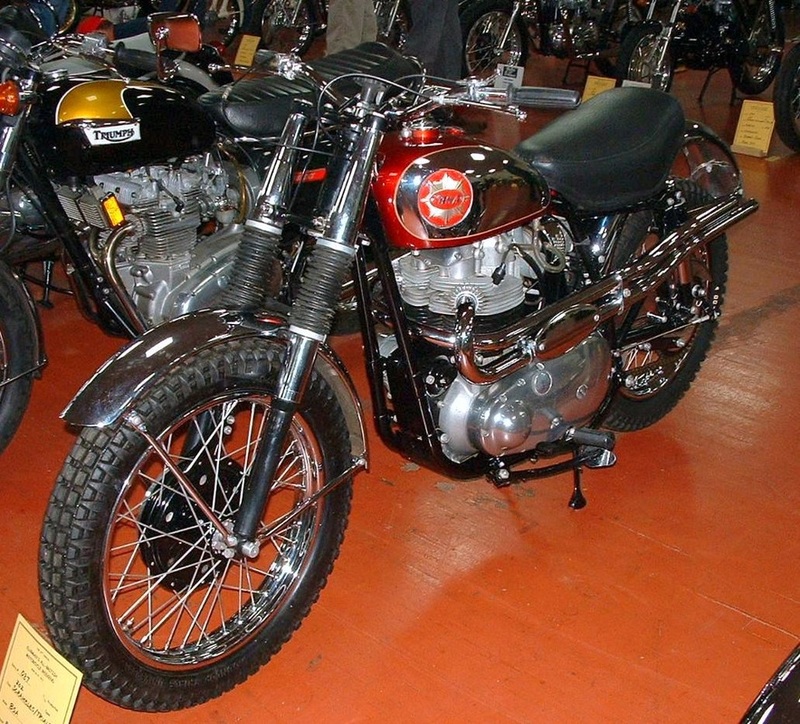 This is the real thing with a letter of authenticity from the BSA Owners Club describing its initial sale in the United States in 1963. 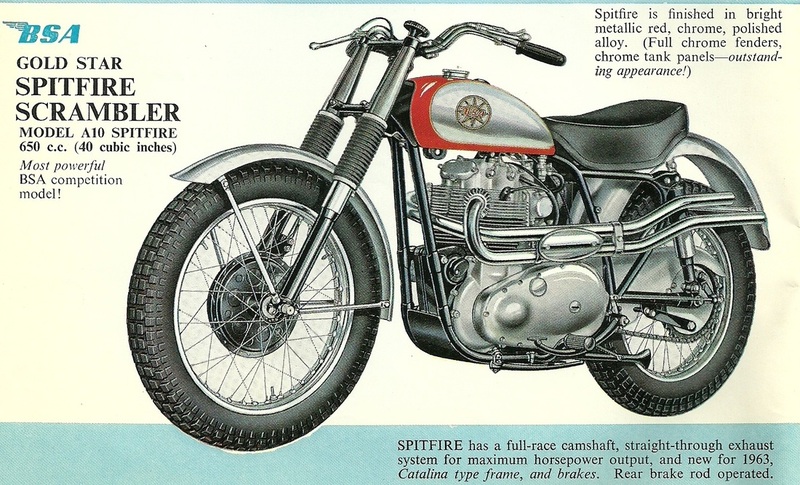 This bike is one of less than 300 made and was the epitome of off-road competition in the 1960s. 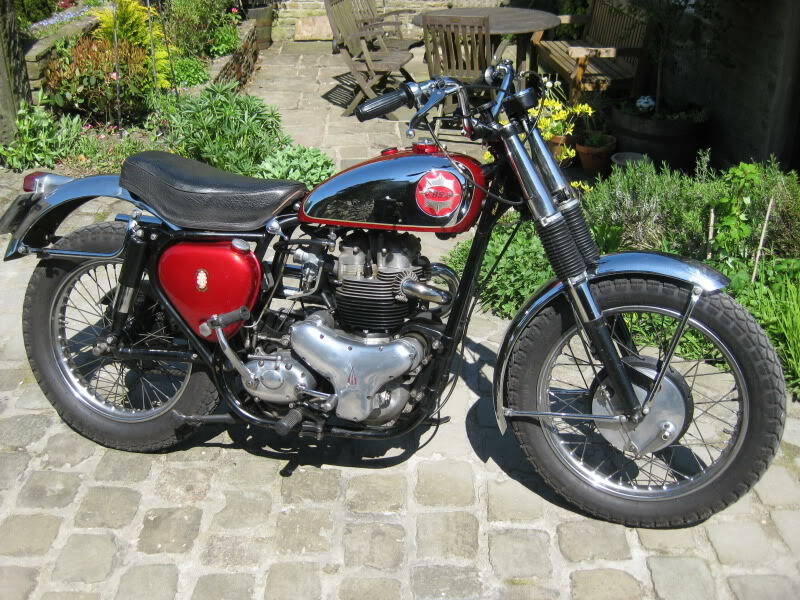 The last of the BSA preunits it has been restored to as correct a status as can be determined from original photos and runs great. The RGS Spitfires were only made for two years and each one is unique in many ways from the A10s of the day. It has the 4 lug frame, half width brakes like the Catalina, no rear pillion loops plus several other high performance features." "I am now the proud owner of this 1963 Rocket Gold Star scrambler, having purchased it from Barnfield Classics in the summer of 2007 in a fairly sorry state. I didn’t know a great deal about them as they are pretty rare in the UK - infact in the world, so I started researching on the internet- mainly American sites- to find out as much detail as possible. If you are a GSS owner and have not already done so, please email Ian Jackson at the GSOC UK (ian@ralphtall.com) with your engine and frame numbers so you can have your bike recorded. He can also provide you with dispatch record details.